Albert James Pickett's History of Alabama, and Incidentally of Georgia and Mississippi, from the Earliest Period first appeared in Montgomery bookstores in September 1851. The buyers of his two-volume work paid $3 and the demand caused Charleston publisher Walker and James to issue a second and third edition before year's end. William Gilmore Simms, the South's most prolific writer, referred to the publication as "one of the prettiest specimens of book making ever done in America." Newspapers in Alabama and literary journals in New York, Charleston, and New Orleans commended Pickett for his "absolutely enchanting" fresh writing style, for using "great care" throughout his book, and for "his important service to his state." While some reviews questioned his narrative style, his sources, or his focus on facts, others credited Pickett for producing "a very valuable" chronicle for the people of Alabama and urged him to produce a third volume for "rising generations." Pickett opens volume one with Hernando de Soto's explorations from Florida to Arkansas, encounters with native people, and discovery of the Mississippi River. He shifts from the early chiefdoms of the protohistoric period to the Natchez and smaller tribes in the coastal plain and then to the major Indian nations of the interior into the late eighteenth century. While the struggles of French Louisiana with the Natchez dominate the first volume, Pickett establishes the English presence with the founding of Oglethorpe's Georgia colony and ends with the surrender of the French forts Tombecb and Toulouse to the British. In volume two, Pickett traces the English push into present-day Alabama and Mississippi and the Revolutionary War era, the Spanish occupation of East and West Florida, the intrigues of Alexander McGillivray and William Bowles, and Georgia's Yazoo land sales. He devotes several chapters to the Mississippi Territory, Aaron Burr, and the Indian unrest that led to the massacre at Fort Mims, the Creek War of 1813-14, and Andrew Jackson's campaigns to destroy the Red Sticks and defeat the British in the Gulf South. 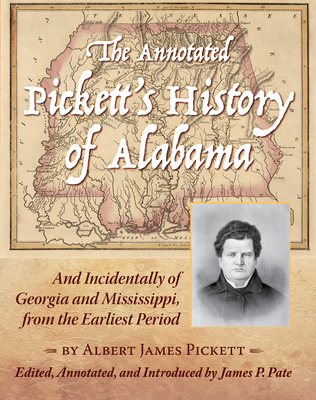 Pickett concentrates his final chapters on the emergence of Alabama as a territory and state, including biographical sketches of early state leaders, the state constitutional convention, and Alabama's first governor, William Wyatt Bibb, who died in 1820. Despite Pickett's failure use his firsthand knowledge to bring his History chronologically beyond 1820, his work continues to be a relevant study of the state's protohistory, colonial, territorial and early foundations. His work and his papers in the state archives are cited by all serious scholars who study Alabama's colonial and territorial eras. While he sought all the available printed primary sources and manuscripts for volume one, his second volume was principally informed by the memoirs, reminiscences, letters, and oral interviews of the participants in the events that shaped the development of Alabama from the pre-Revolutionary era through the 1840s. Although recent literary deconstruction of Pickett and his History has been critical of his motivation and writing, Harper Lee, Alabama's most consequential writer in the twentieth century, asserted in 1983 that he "deserves a place in American literature" and assessed his History as a "unique treasure" that "should be in every high school library" in Alabama. More recently, historian Leah Rawls Atkins declared Pickett to be the writer made the "most historical contribution to Alabama" in the antebellum period. This new edition is the first to provide general readers and scholars with a readily available hardbound, fully indexed, and annotated version of Pickett's History.